Today I turned another year older... which means I must be wiser too! I remember hanging out to get older when I was young... but then in my twenties I began to want to be younger again (hanging out with young people in youth ministry didn't help). In many countries, age is something that is rejoiced over, grey hair is something to be proud of. Why is it then that many of us cringe when someone asks our age, or mourn at each passing year? A couple of years ago, my perspective of age changed. My eldest son was doing his homework, and needed to read some words to me from his book. There were many different words listed in the book, with their meanings. As he read the words and their meanings out loud, he came to the word 'old person'. I was intrigued by the meaning listed... 'someone blessed with a long life'. I have never forgotten that statement since. 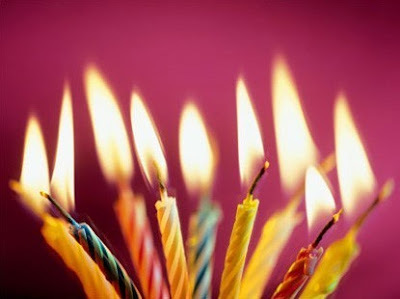 Every birthday I now celebrate another year of life, another step towards living a long life... I am so thankful that I am celebrating another birthday! Yah indeed...happy birthday and may you be blessed with a very long life (just like the meaning)! Hope you got some good presents! You're my favourite youth pastor! I'll help keep ya young!